Martial arts are among the most popular sports in the world. 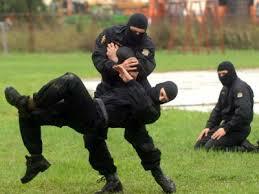 Being able to protect yourself in a dangerous situation is exactly what lures many people to martial arts. On top of that, they will teach you discipline and will make you more humble, which are qualities that everyone should strive to have. If your gym offers martial arts classes, then you’ll need appropriate gym mats in order to ensure the safety of the participants. Similarly, if you have a garage gym, it’s imperative that you find good mats to avoid any potential physical risks. There are a few different types of gym mats available on the market today, but EVA jigsaw mats are most likely the best you’ll find. Here are some of the main advantages of EVA jigsaw mats. In order to practice martial arts properly, you’ll need to have good support when upright. Otherwise, you will waste a lot of energy on trying to maintain control. EVA jigsaw mats are made with non-porous, closed-cell EVA foam, which makes them more rigid than other mats, thus providing more support. The cost of gym mats is extremely important to most people, since both owners of independent clubs and home users usually don’t always have a big budget. Even though both MMA mats and vinyl tatami mats are made using quality materials, they can be very pricey, thus making them unattainable for people who’re on a budget. On the other hand, EVA jigsaw mats are quite affordable. They come in a variety of thicknesses, but people usually choose between 20mm and 40mm thick mats. The 20mm floor mats are cheaper and they’re commonly used in upright forms of martial arts like kick boxing, taekwondo, and karate. On the other hand, the 40mm mats are better for floor-based martial arts like judo and wrestling. Before you decide to buy new mats, make sure to check exactly what thickness suits you best. The fact that you’re able to choose exactly how thick you want your gym mats to be is yet another advantage of the EVA jigsaw mats. Vinyl tatami mats are usually found only in 40mm thickness, which means that you wouldn’t exactly be suitable for upright forms of martial arts. One of the best things about EVA jigsaw mats is how light they are. This will make it easier for you to transport them from one place to another. They’re easy to lift, so you will have no problem storing them wherever you choose to. On the other hand, if you go with vinyl mats, you will have difficulty moving them from place to place, since they’re made out of heavy materials. When buying gym mats, you want a product that is going to remain in good condition for a long time. Thankfully, EVA jigsaw mats are made from ethylene vinyl acetate, which is an elastomeric polymer that is known for its durability and resilience.